Maggie Abe, a student at Colby College in Waterville, Maine, spent the summer in the Freer|Sackler’s American art department, where she was the Lunder Consortium for Whistler Studies intern and did research for an ongoing technical and art historical study of Whistler’s watercolors. 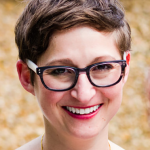 She will graduate from Colby College in May 2014 with BAs in studio art and biology. The Lunder Consortium for Whistler Studies is supported by the generosity of the Lunder Foundation and comprises the Freer|Sackler, the Colby College Museum of Art, the University of Glasgow, and the Art Institute of Chicago. Despite accusations of reducing them to arrangements, notes, and harmonies in his paintings, the women whom James McNeill Whistler (1834–1903) kept for company were driving influences in his life and art. Although he vocally eschewed narrative in his works to focus on color, his feelings for his female subjects are couched in the subtleties of his compositions. Beneath carefully crafted color harmonies linger the unspoken wishes, unrealized fantasies, and quiet lamentations of a man probably not as aloof as he would have had the public believe. Whistler’s complicated relationship with his long-term mistress and model Maud Franklin (1857–1941) provides the basis for several sentimental watercolors in the Freer collection. They were together for more than a decade, but because they never married, Maud was excluded from society. These watercolors are tender impressions of how Whistler saw Maud and wished she could be seen by his acquaintances: as his significant other deserving of their respect. Pink note: The Novelette, Note in Opal: Breakfast, and Bravura in Brown, all painted from 1883–84, are united by a common formula. In all three, Maud is alone, but props such as empty chairs and rumpled bed sheets suggest her companion has only just stepped out. Reading or playing the piano, she is introspectively occupied: a demure woman in an attractive, but not ostentatious space. Unlike Whistler’s earlier oil Arrangement in White and Black, in which Maud’s youth and immodesty are hard to ignore, these watercolors do not put on a show, but rather leave a gentle impression. To Whistler, they were probably bittersweet, allowing him to pretend that his life with Maud was as pleasant and stable as the watercolors suggest. In reality, it was only on paper that she would be received by the homes of proper society. Notwithstanding their volatile relationship, Whistler painted Maud with great affection in these watercolors. She is repeatedly depicted in rooms with art, the obsession of Whistler’s world. 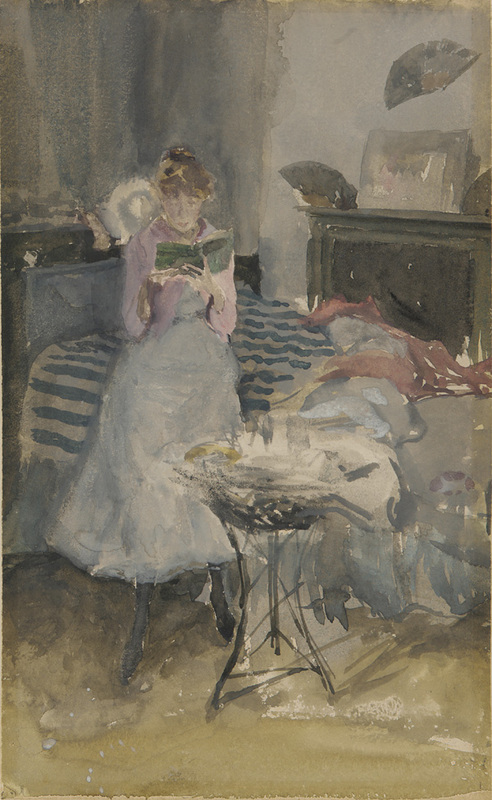 Paintings feature in the décor of all three rooms; indeed, one scholar suggests that the color of Maud’s blouse in Pink note: The Novelette is meant to connect her with the pink-tinged painting on the mantle. As Maud posed for more than 60 of Whistler’s paintings, drawings, and prints, it is hardly surprising that he would associate her with his art. By placing them together in these images, Whistler is acknowledging her influence in the development of his passion. While such sentiment for a mistress seems to go against the grain of Whistler’s general reputation, it is important to note that these paintings were the products of his standing as an aging artist with an established name. Unlike the earlier days when he lived with his first mistress, Joanna Hiffernan, as a relatively unknown artist with something to prove, 50-year-old Whistler did not feel content living as a rogue on the fringes of society. Whistler and Maud’s relationship began to suffer in 1879, when the artist went bankrupt and was forced to face reality. When he suddenly proposed to Beatrix Godwin (1857–1896) in 1888—a marriage that would provide him with stability, order, and favorable connections—it may have been that the opportune moment had finally presented itself after years of mounting discomfort. 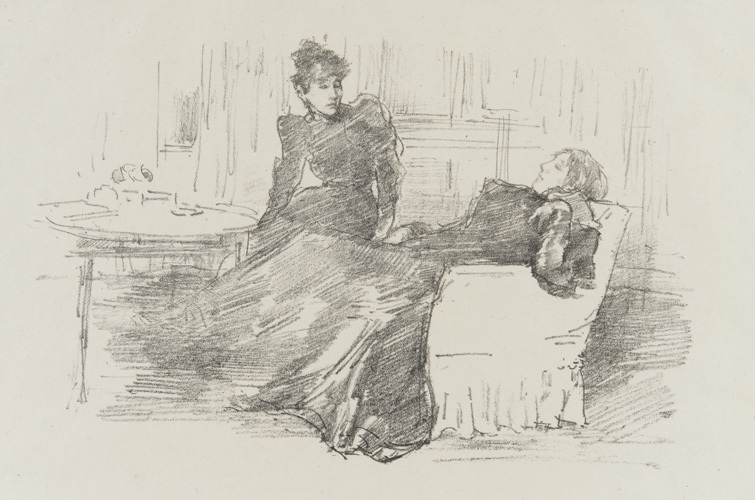 The tables turned in Whistler’s art: in the watercolors, he altered Maud to satisfy his desire to change reality, but in later depictions of his ailing wife Beatrix, his art became an outlet for his grief. This time, it was an inescapable sickness that snapped Whistler from his reverie.